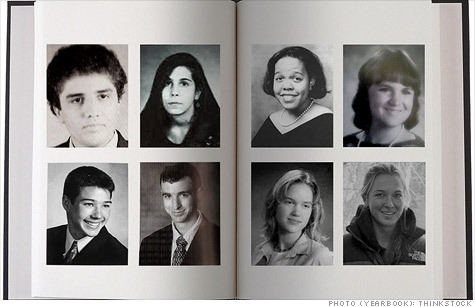 Online yearbook photos, like the ones featuring CNNMoney employees above, are growing in popularity as schools cut budgets. Click on the image to hear how one school made the switch. NEW YORK (CNNMoney) -- As graduation day arrives, students will say goodbye to their classmates and teachers. And many are departing without a traditional yearbook to preserve those memories. State budget cuts and the weak economy are causing elementary schools, middle schools, high schools and colleges across the country to either do away with yearbooks or look for more cost-effective publishing options. Research firm IBISWorld estimates that the traditional yearbook publishing industry has seen sales to schools decline by 4.7% a year over the past few years. The decline has come as both public and private schools struggling with insufficient funding put their limited resources toward areas like staffing instead publishing yearbooks -- many of which go unsold, especially in recent years as disposable incomes have suffered. "Our country is handing out pink slips to teachers right and left, and if it comes down to teachers versus yearbooks, yearbooks are going to lose," said Marc Strohlein, principal at consulting firm Agile Business Logic. This is the first year that Indiana's Huntington University isn't offering yearbooks, after budget constraints forced the school to reallocate the $40,000 year it typically spends to publish 750 yearbooks. "Budgets being what they were and the economy being what it was, forced our hand on this one," said Ron Coffey, Huntington's vice president for community development. "But I think given the economic times, the students are understanding of the difficulties that we and other schools are experiencing." Students at Mokena Junior High School, in Illinois, won't be taking home yearbooks either, after the school district lost funding for all extracurricular activities this year. And Blaine High School in Washington is in the same boat, and likely won't be handing out yearbooks next year due to a severe lack of funding for the program. But while some schools are abolishing the keepsake altogether, others are turning to new online yearbook companies like YearBook Alive, Lulu, Lifetouch and TreeRing. TreeRing, for example, is an electronic yearbook company that lets schools design yearbooks, giving students the option of viewing them online, or ordering a printed copy for just $12 to $17 per book. More than a million photos have already been uploaded, and more than 50,000 students are using its services. TreeRing says it is now providing yearbooks for hundreds of schools that would have otherwise eliminated the tradition altogether. Sales have soared 600% since the company launched two years ago. The company estimates that each school saves an average of $300 to $1,000 in unnecessary printing costs -- adding up to a combined savings of between $100,000 to $200,000 this year for all the schools using TreeRing. Students typically have to pay for their yearbooks to help defray costs for the schools. But because schools don't always know exactly how many students will want yearbooks once they arrive, they often place big orders with the traditional publishing companies and are left with many unsold yearbooks that the payments they get from students don't come close to covering. "We just signed on with a school in San Francisco that was losing almost $2,000 a year in leftover books," said Aaron Greco, co-founder of TreeRing. "It's just so crazy, because $2,000 could buy five computers with an education discount." While the major publishing companies mass produce yearbooks using the traditional -- and expensive -- printing method of offset, electronic printing has improved so much recently that the quality is just as good, said Greco. The company will also soon introduce an online signing function, so students can digitally sign each other's yearbooks books. One inner-city elementary school with a large population of lower income students, Alvarado School in San Francisco, wasn't able to afford offering yearbooks at all until it heard about electronic options that don't incur costs on the school. "Financially, it would have just been ridiculous to try to do it -- the school can't even afford paper and pencils, so to outlay money for a nice-to-have item like a yearbook wasn't even something that was considered," said Tim Smith, a parent and teacher at the school. This year, nearly half of the school's 484 students bought yearbooks, averaging only about $13 each. The others were still able to create yearbooks, view them online and share them with friends. Budget crunches aren't the only reason for the shift. Huntington University's Coffey said while the school's budget crunch was the main culprit, students are simply more interested in reliving school memories with photos and comments online. Electronic yearbooks give students the ability to customize pages, and share them using social networking sites. "The personalization makes it into something about the student, not just the school," said Greco. "We're seeing a death of the traditional yearbook and an age of the personalized yearbook." Coffey wonders whether social media and Facebook will eventually replace yearbooks altogether. "Our view is that interest in yearbooks has waned to some degree," he said. "It's not that no students are interested, but with the advent of Facebook and other social networking opportunities, these are often more readily available and interesting venues than the old yearbook world." But the disappearance of such a long-standing tradition is always hard for some people to accept. "The tradition is the biggest factor -- it's always hard for students to think of life without it," said Coffey. Calling all extreme savers! Do you do unusual things to save a couple bucks? We're not looking for coupon clippers and recyclers -- if you have an unusual way to save money, please e-mail blake.ellis@turner.com and you could be included in an upcoming story on CNNMoney.